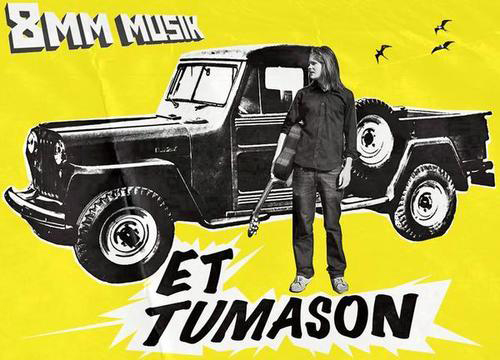 ET Tumason sounds a lot like Robert Johnson if Robert Johnson were suffering from cabin fever and had just taken a lot of speed. The hyperactive Icelandic blues protege started playing music when he was 5, and taught himself the blues when he was 13 under the guidance of some old Fred McDowell and Robert Johnson 8-Tracks he found down on the docks. When he was 18, he was forced to leave his native Reykjavik for reasons we won’t dare get into here, though one day he’ll sing you a song about it. He fled with nothing but his guitar and a change of socks to Berlin, Germany. This is where he first met nascent Berlin indie label 8MM Musik while drinking at their infamous 8MM Bar. He slipped them a demo CD, and then proceeded to slip out on his tab. Once the 8MM boys heard the music, they picked up his trail in one of the seediest, godforsaken, red lit parts this side of town. Once they finally tracked him down, they immediately offered him all the lager he could guzzle in a fortnights time and the opportunity to play an extremely rare live show at 8MM, as well as a much needed shower. The first show in 2006 went so well, that he has been back to 8MM many a time, as well as to play venues around the city. He ain’t skipped out on a bar tab since. In the summer of 2006, ET relocated again, this time to Copenhagen, searching for what only the lord and ET Tumason’s heart knows for sure. He ain’t found it yet, and lets hope for the sake of his craft, he never really does. Here's the info on my drummer. His name is Karsten Garner.. He's a kickass drummer that plays with many bands, incl. Who Are You People?, Copenhagen Klezmer Band, Spektr, She Talks.. He will be bringing his Cajón. ET Tomason er uden tvivl Islands svar på Robert Johnson … på speed! Spor fra blues’en fra Mississippi-deltaet er helt tydelige, men her er der blot skruet gevaldigt op for tempoet og guitarlyden er så beskidt og kradset som aldrig før. Fysisk har han kun medbragt en guitar fra Island, men rødderne slår ikke fejl  den islandske prærie er dagklar i ET Tumasons blues!